Rice is ready to be harvested when the grains are hard and are turning yellow/brown. That is about 30-45days after flowering or a month after 50% flowering. Cut the stems with sickle about 10-15cm above the ground lay harvested rice crop in upright position for drying before threshing begins. - Thresh immediately after harvesting and drying to avoid losses. - Use whacking frames or mechanical devices, but avoid threshing on bare floor to prevent sand, pebbles and other foreign matters. - Thresh on mat or tarpaulin over concrete floor or by flailing (i.e beating rice against the floor or against a stick of drum. 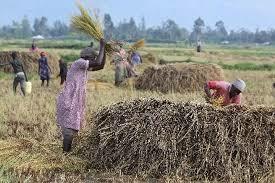 - Threshing carefully avoid de-husking the grains. - Winnow to separate the chaff and empty grains from the well-filled matured grains. - Remove foreign matter in the paddy to avoid localized heating spots during parboiling. 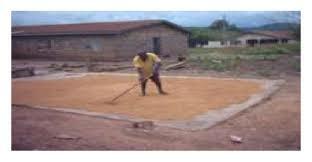 - Dry paddy properly to a safe moisture content of 13%-14% by spreading in thin layer (2-3cm thick) on clean concrete floors, mats or tarpaulin and turning over periodically. - Sun dry slowly for 2-3days to reduce breakage during milling. - On a clear bright day, sun day for one day(9-10hrs) only by spreading paddy thinly on clean concrete floors, mats or tarpaulin. - Use a mechanical drier if available. - Avoid drying on bare floor or roadside. - Soak paddy in hot water at 700C for 6 hours. - Remove all floating empty grains. - Parboil rice by steaming rice paddy in jute bag for 10-16 minutes. - Suspend the bag over steaming water in a drum. - Stop parboiling when rice husks start to split open. - Chalky grains or white centers indicate incomplete parboiling which may cause breakage of grains during milling. - Parboiling can also be done using earthen pots or empty petrol drums depending on quantity of rice. This is a process of removing the husk from the grains. 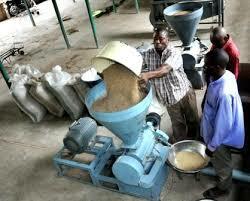 Greater efficiency in the milling process results to whole grain with minimal broken grains to attract good price. - Always mill rice in two stage milling machine. - Always mill one pure variety at a time. - In Storage of rice paddy Make sure you store rice in 65% relative humidity. - Design and operate aeration system to maintain uniform rice paddy moisture and temperature. - Inspect rice paddy regularly weekly. - Used dried chilli pepper to keep pests away. - Apply 2 tablespoon of phostoxin in an unsealed envelope per 50kg bag of rice grain. - Treat seeds/grains with activated silica gel powder to dehydrate possible insects in the bulk. - Store grains in extreme low temperature. - Use airtight containers for grain storage.